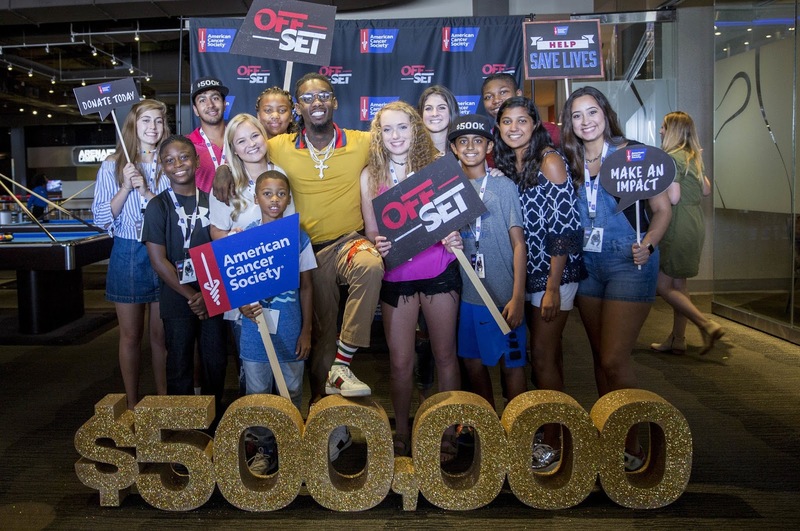 Rapper Offset, of the chart-topping hip-hop trio Migos, is teaming up with the American Cancer Society and mobilizing his fellow artists, corporate sponsors and passionate fans to raise $500,000 for the organization. Offset's dedication to the fight against cancer is personal. His inspiration for working with the American Cancer Society is his late grandmother, Sallie Ann Smith, a significant role model in his life who died of bladder cancer in 2012. After Mrs. Smith's cancer diagnosis, her family learned firsthand about the positive impact the American Cancer Society programs and services make on families. "It was really tough losing my grandma to cancer and one of the hardest things I have dealt with in my life. She motivated me to do my best and go for it; one of my biggest coaches," said Offset. Fellow Migos members Quavo and Takeoff, along with their record label Quality Control Music are rallying their networks to help Offset reach his fundraising goal because cancer has impacted all members of Migos. "We're proud to support Offset's efforts to help raise money for the American Cancer Society, so they can address cancer in underserved communities," say Quavo and Takeoff. "We encourage all our fans to donate if they can." Despite recent progress against cancer, not all Americans have benefited equally. African- Americans have the highest death rate and shortest survival of any racial/ethnic group in the United States for most cancers. The causes of these inequalities are complex and reflect social and economic disparities. Much of the disparity is due to unequal access to health care. Offset is honoring his grandmother through this campaign by helping raise funds to promote cancer prevention and access to care in underserved communities. In addition, money raised through this effort will also help fund an ACS Research Grant focused on bladder cancer research. "I am thankful to be partnering with the American Cancer Society to help save lives against this horrible disease. It's especially important for me to give some love to my community and do what I can to help," Offset says. Offset's mother, Latabia Woodward, an American Cancer Society supporter and volunteer for over a decade, is proud of her son. "Losing a loved one to cancer is devastating, and we need to continue to help educate our communities about early detection and screening guidelines. I am incredibly proud of Offset's desire to help save the lives of others, genuine heart and talent as an artist." 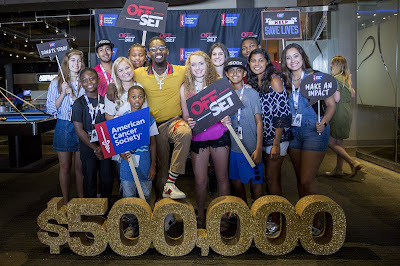 Offset hosted a launch party yesterday at Main Event Entertainment in Atlanta, Georgia, where he spent the day with teens and young adults whose lives have been impacted by cancer. In addition, Offset's fans can also donate to a special Prizeo campaign – prizeo.com/offset – which will enter them for chance to win a shopping spree with Offset. "We are honored that Offset chose to work with us. His inspiration and support for the American Cancer Society is one that makes him a unique artist – one who wants our world to be better." said Sharon Byers, chief development and marketing officer, American Cancer Society. "Offset's fundraising campaign is a significant opportunity to leverage the music industry and his contacts to support our mission which is why we are very appreciative to be able to partner with him." To join Offset's fundraising campaign, visit prizeo.com/offset. For more information about Offset's work with ACS, please go to cancer.org/offset. Offset was born and raised in North Atlanta where he began his music career and still calls home today. He is one-third of the platinum selling group, the Migos. In 2017, Migos, won two BET Awards and were nominated for multiple Billboard and MTV Video Music Awards for the success of their album Culture and chart topping single Bad and Boujee.